Google Classroom is one of the nicest kids on the playground of education technology. There are many apps and websites that want to play with Google and Google is happy to play with so many of the other apps and sites that are enjoying the nice days and time to play. Matt and Kasey share and discuss some great tools that are fine on their own but when they play Google we never want edtech recess to end! Duolingo -- Many teachers and even entire governments around the world already view Duolingo as the perfect blended learning companion for their language classrooms. Duolingo lessons give each student personalized feedback and practice, preparing them to get the most out of classroom instruction. Edpuzzle: Make any video your lesson. Pick a video, add your magical touch and track your students’ understanding. With the EDpuzzle integration, teachers can automatically import all Classroom courses and students at sign up. Jennifer (New York) -- Mark from Wisconsin asked on episode 80 about turning off spell check to proofread a poorly written letter. I have an assignment in Literature that requires the students to proofread a poorly written letter (roughly 50 mistakes) and make corrections. Is there a way to turn off Spell Check in the shared document? I have it turned off on the master copy, but when I send it out through Classroom, each of their Chromebooks turns Spell Check back on. Thanks! 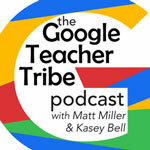 Blake (Texas) -- Hey y'all, I'm a 1st-grade teacher in Texas and I listen to GTT on my way to work all the time. Then, I run in my classroom and write down the ideas you have sparked so that I can try them. One of the ideas is to use slides as kind of an "auto-pilot" for a day when I may need a sub. I have 2 large screens in my room and the idea was to make a slide deck that would walk them through the day. (I've even considered uploading videos of myself teaching the lesson and explaining. Phonics, for example, is a difficult lesson to teach as a sub.) So, the sub walks in and opens the slide deck at 8am. and the slides have instructions/video/example ... the students do the work... and then the slide changes to a yellow background when there are 5 minutes left, then to the next thing on the agenda. Yea, sounds like a neat thing to try to me too. But I can't use a slide deck because I can't set different times for the auto advance. That was a long way to ask if you know of a way to set different times for each slide. I know I could use another presentation app but we live on the G suite at my school so sharing would be easier if I could find a work around on slides. Thanks guys. Y'all are awesome! I'm off to drink my sweet tea before the fun times get back from P.E. Make it into a video with Screencastify and advance as you’d like? Then play the video?